What's Going On With Alex Smith? The Kansas City Chiefs are making a change at quarterback: the team will start Nick Foles over Alex Smith for Sunday against the Jaguars. Tyler Bray will be the backup; Smith won’t even dress. Is Smith still suffering the effects of brain trauma from Sunday’s game against the Colts? The Chiefs aren’t even being clear on that. Burkholder said the last part of the concussion protocol had not occurred at the time of Crews’ announcement. That part requires the team physician, the independent consultant and/or Burkholder to review video of the hit. “(Like) whether we think he was unconscious (and) he said not,” Burkholder said of what he looks for on the video. “So there’s a lot of steps there and it takes 15, 20 minutes to get through. Here’s a simpler version: Smith’s head becomes acquainted with the ground; team clears him; Smith’s head hits the ground again; team announces he won’t return and has a concussion, even though they were still checking him out; Reid says Smith doesn’t suffer a concussion; Chiefs spokesperson says Smith did suffer a concussion; Chiefs trainer says Smith never had a concussion in the first place and has no symptoms. Yet he’s still not going to play. Today, Smith is in the “return to participation” protocol and is supposed to practice. Being in that protocol would imply that Smith was diagnosed with a concussion at some point. Being able to practice would imply that Smith is healthy. And if Smith were healthy, he would be starting at quarterback. 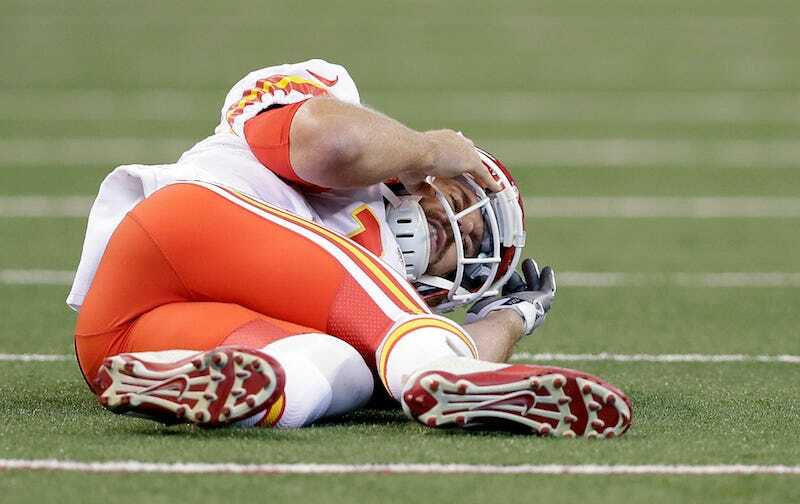 Alex Smith is fine, but not fine enough to play on Sunday, or even to play in case of emergency. What does the man at the center of this have to say about it? Concussions are difficult to diagnose because symptoms don’t necessarily appear right away, and miscommunication between medical staff and coaches appears to have exacerbated the confusion in this case, but the NFL’s protocol makes all of this incredibly hard to follow. Smith smacked his head twice, looked woozy, and was examined both times, but supposedly didn’t have a concussion or any symptoms, yet he’s already been ruled out of this weekend’s game for ... reasons. The protocol might have accidentally been a success in that Smith won’t be rushed back on the field too soon, but how the Chiefs got to this decision seems impossible to figure out.